Social Anxiety refers to feeling self-conscious and having a fear of negative evaluation around other people. It is usually most intensely triggered by strangers, groups of peers, authority figures and people that you admire and/or are attracted to. The anxiety usually takes the form of self-deprecating thoughts such as “They can tell I’m anxious.”, “I don’t know what to say.”, or “They don’t like me.” For some people, social anxiety also takes the form of physical symptoms such as sweating, blushing, or nausea. The anxiety, the thoughts, and physical symptoms are all very responsive to treatment. The triggers of social anxiety vary greatly from person to person. I was most self-conscious around strangers and groups of peers, but for some reason I was always okay with giving presentations. Some actors I’ve treated were completely comfortable on-camera, but acutely self-conscious while trying to small talk. Most patients are more self-conscious around strangers, but I have had some patients who were most anxious around close friends. Each person’s specific triggers vary depending on their personal history and life experience. Although the pattern of social anxiety varies from person to person, each person I have treated usually has a good sense of what their triggers tend to be. Knowing your triggers is an excellent step towards treating your social anxiety. It will help you as you practice the treatment techniques. Social anxiety also has an unpredictable quality. Although most patients know their triggers, they also notice good days and bad days. I was anxious most of the time, but on rare occasions I was quite outgoing. I distinctly remember hoping that a first date happened on a “good day.” Many of my patients tell me that it’s hard to predict when they will be anxious around their triggers, because some days are better than others. Being mindful of how your day is going will help you pick the right treatment technique for that particular day. The best way to find out whether or not you have social anxiety disorder is by meeting one-on-one with a mental health specialist (i.e. a therapist or a psychiatrist). Short of that, you can still get a good idea about the diagnosis from the DSM-IV criteria and the Liebowitz Social Anxiety Scale. The DSM-IV (short for Diagnostic and Statistical Manual, version 4) contains the criteria that psychiatrists such as myself use to make a psychiatric diagnosis. The criteria attempt to be objective and clear cut, but in practice we have to use a lot of judgment to decide whether or not each patient qualifies for each criteria. However, even if you do not qualify as having "full-fledged" Social Anxiety Disorder, the treatments described on this website are likely to help you for whatever level of social anxiety you do have. A marked and persistent fear of one or more social or performance situations in which the person is exposed to unfamiliar people or to possible scrutiny by others. The individual fears that he or she will act in a way (or show anxiety symptoms) that will be humiliating or embarrassing. Note: In children, there must be evidence of the capacity for age-appropriate social relationships with familiar people and the anxiety must occur in peer settings, not just in interactions with adults. Exposure to the feared social situation almost invariably provokes anxiety, which may take the form of a situationally bound or situationally predisposed Panic Attack. Note: In children, the anxiety may be expressed by crying, tantrums, freezing, or shrinking from social situations with unfamiliar people. The feared social or performance situations are avoided or else are endured with intense anxiety or distress. The avoidance, anxious anticipation, or distress in the feared social or performance situation(s) interferes significantly with the person’s normal routine, occupational (academic) functioning, or social activities or relationships, or there is marked distress about having the phobia. The fear or avoidance is not due to the direct physiological effects of a substance (e.g. a drug of abuse, a medication) or a general medical condition and is not better accounted for by another mental disorder (e.g. Panic Disorder With or Without Agoraphobia, Separation Anxiety Disorder, Body Dysmorphic Disorder, a Pervasive Developmental Disorder, or Schizoid Personality Disorder). If a general medical condition or another mental disorder is present, the fear in Criterion A is unrelated to it, e.g., the fear is not of Stuttering, trembling in Parkinson’s disease, or exhibiting abnormal eating behavior in Anorexia Nervosa or Bulimia Nervosa. Generalized: if the fears include most social situations (e.g., initiating or maintaining conversations, participating in small groups, dating, speaking to authority figures, attending parties). Note: Also consider additional diagnosis of Avoidant Personality Disorder. The Liebowitz Social Anxiety Scale is a research tool used to measure the severity of social anxiety. While various cut-offs (for example, more than 54 points) can be used to diagnose social anxiety disorder, it is most useful as a way to measure the severity of your social anxiety and to track your improvement later on. There are three specific social anxiety symptoms that you should also know about: Anticipatory Anxiety, Debriefing Anxiety, and Passive Social Anxiety. I will refer to these as you read through the techniques this website so it’s good to become familiar with them now. 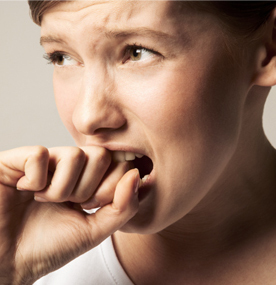 Anticipatory anxiety means experiencing worry before a social event. Depending on the event and your level of social anxiety, anticipatory anxiety can start hours, days, or even weeks beforehand. I used to worry about 5 days before dates, and about 2 days before all other social events. In my experience with patients, wedding speeches and presentations are the most common trigger of anticipatory anxiety that can start even months beforehand. When you decrease you anticipatory anxiety, you will go a long way toward decreasing your anxiety in he moment itself. When you stop anticipatory anxiety, you also stop "practicing" the anxious thoughts as often and so your mind is no longer as good at producing it. With treatment, you should notice that anticipatory anxiety becomes less intense, shorter in duration, and less frequent altogether. Debriefing anxiety refers to reviewing and feeling anxious about a social event after it has occurred. This typically takes the form of criticizing yourself about how you did. Debriefing anxiety can last from days to weeks after an event, and if you had a particularly bad experience (for example, an embarrassing moment in grammar school), you can continue to have debriefing anxiety even years later. Debriefing anxiety is also very responsive to treatment. I only became fully aware of my debriefing anxiety a few years ago. What I noticed was that after a social event (for example, having dinner with a friend) the next morning I would review in my head everything that was said (even if the event itself went well). This would generally start out as an innocent review, but eventually I would always find something to worry about or be irritated by and from then on I would just focus on that part of the event. There have been several times where I had fun in the moment, but then my memory turned the event into a negative because I did too much debriefing. Decreasing debriefing anxiety naturally leads to decreasing social anxiety in the moment itself. For me, it used to be that socializing with a friend might have 1-2 weeks of my mood riding on it. Now, when I hang out with friends, a lot of the pressure is off because I know I can stop thinking about it the next day. Passive social anxiety refers to feeling self-conscious and having a fear of negative evaluation when you are in a crowd, even if you are not interacting with anybody. Common examples include: feeling anxious and self-conscious when walking through a mall, sitting at the beach, walking into a bar or and watching a sporting event or concert in a large venue. My passive social anxiety used to be so intense that I would even feel self-conscious just walking down the street. Cognitive Behavioral Therapy is very effective for treating passive social anxiety.